Apoterra, means "derived from the earth"
Previously known as Caru Skincare Co, Apoterra Skincare is an apothecary based in NYC devoted to helping solve adult skincare issues like dry skin, adult acne, and premature aging holistically, while doing it in a transparent and sustainable way. We make natural, good for you and the planet, effective and affordable skincare products that enhance your daily skincare ritual through aromatherapy and sensorial beauty. We specialize in healing the skin holistically by rebalancing dry and break our prone skin back to a healthy glow. We handcraft every product with care, using only fresh and sustainably sourced ingredients. All our formulations are based in a blend of herbalism, aromatherapy, and scientific research to provide you with the highest quality plant + mineral based skincare. Since our launch in 2012, our products have been featured in publications such as Vogue, Time Out NY, Allure, Forbes.com and Lucky. Elle magazine listed one of our serums as one of the top 33 most effective natural products on the planet in 2015 and Refinery29 nominated our Activated Purifying Mask for their 2016 Best of Beauty Innovator Awards. Our products heal the skin holistically. We believe that the key to glowing skin is through nourishment and enhancing your skin’s natural beauty, not fighting it. We offer a full facial care line that is customizable to your unique needs. Using our color coding system and our free skincare guide, you can customize your skincare ritual to meet your unique skincare needs. Your ritual can easily change as your skincare needs change. Our products improve more than just your skin. Through aromatherapy and sensorial pleasure, our plant + mineral based products enhance your daily skincare ritual. The aroma, texture and color of our natural products are meant to take you away from daily stresses and provide you with a daily oasis where you can indulge your senses. We specialize in balancing dry/combination skin that is break out prone. Although our skincare line is suitable for all skin types, our entire collection excels at healing skin that is both dry or combination and break out prone. We do this by nourishing the skin with nutrient-dense plant oils and minerals, improving skin barrier function with cell-communicating ingredients, and healing flare ups with anti-bacterial and anti-inflammatory ingredients. Our dream is for you to be connected to the farmers and distillers that produce the gorgeous raw plant and mineral ingredients we use to make our products. Our first step to achieving this dream is our batch # system, which allows you to look up the country of origin and certification of all our products. We are committed to producing sustainable natural skincare. When we create our products, we consider the entire cycle, from ingredient sourcing to where the used bottles of our products end up. Our dream is to source all ingredients directly from small organic farms and use packaging that has no negative impact on our planet. We currently work with some small farms and distilleries, and source organic and fair trade when we can. We package our products in non-toxic, easily recyclable glass, and use biodegradable materials when we can. We use biodegradable materials for shipping, and reuse peanuts, bubble wrap, etc that we receive from vendors. We currently pay to have our energy be provided by wind energy. 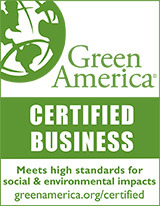 We are a Green America certified business as well as being Leaping Bunny cruelty-free certified. Dominique Caron is a certified aromatherapist, herbalist, and daughter of a family physician. She founded Apoterra Skincare (formerly Caru Skincare Co) in 2012 after hopelessly searching for affordable, natural and sustainable skincare that was effective for her dry, sensitive skin. Perpetually stuck in the cycle of hormonal acne flare ups, red acne marks, and flaky dry skin, she found an answer to her troublesome complexion in her natural and holistic skincare line. She is now devoted to running an honest and conscious business that provides healthy, sustainable and effective skincare products. Favorite Apoterra Product: whatever she is currently formulating! But she always has a bottle of Rose Hydrating Toner near by.